How do cats cope with cold weather? it sounds like you spend a lot of time outside, and I'm really concerned about you. Thanks for your concern. Don't worry about me. Cats cope with cold weather in all kinds of ways, and I'm just fine! I love being outside, and since I'm outdoors so much, my body has plenty of time to acclimate to the changing seasons. I have my winter conditioning now. And if I get too cold, I can always go inside. That's where I am right now! Our bodies know winter is coming when the days start getting shorter, and there's less light. Changing temperatures don't tell us much, but less daylight does. We start getting ready for winter in the fall by shedding our summer coats. That makes room for our thicker, denser winter fur to grow in. You might not notice this as much if you have a strictly indoor cat. Since an indoor cat's environment is pretty much the same all year long, she sheds all the time. 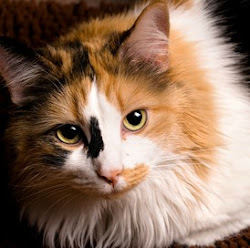 Cats cope with cold weather by eating more in the winter. We need extra energy to maintain our body temperature. In the winter, we gain weight and store the extra body fat to protect us from the cold. I'm tiny, but I'm looking a bit pudgy right now because my fur is so thick, and unfortunately that fat I'm storing shows! Cats cope with cold weather by sleeping more, too. That helps us conserve the energy we need to hunt for food. Of course, cats with families and feral cats with caretakers don't need to hunt, but our bodies haven't seemed to figure that out. Our fur provides insulation. When the weather's very cold, it stands on end, making us look even fluffier than usual. The erect fur traps cold air so our bodies can make it warm and provide additional insulation. When we're really cold, we shiver. That increases our bodies' metabolism and generates heat. Although we can keep ourselves warm in the winter, when it gets too cold, we can suffer from frostbite and even hypothermia. That's really serious and can be fatal. Wind, rain and snow make cold weather especially dangerous. When our fur is wet, it can't keep us warm. And it's easy for an outdoor cat to get lost in the snow. 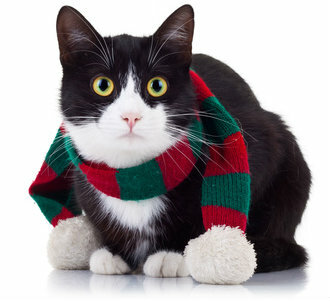 If your cats are indoor/outdoor, it's really best to bring them inside when the temperature drops into the 20s or lower. I hate that, but I guess it's better to be inside than to get sick. At least that's what our human thinks. If your cats live outside, I hope you'll give them a cold weather shelter. Shelters are easy to make, or you could buy one online. Put straw inside instead of a blanket. Straw is warmer than blankets or towels and stays dry. Our human bought me a shelter , and it's right outside our door. I like it, but I'd rather sleep in my cozy covered bed with the Snuggle Safe Disc . My bed's right outside our door, too. But when it's really cold, our human thinks it's not warm enough and makes me come inside. I hate being inside! Really, humans can be so annoying sometimes!